Take prominent race car driver. Disguise as an everyday user of vehicles, if not a bit of a rube. Put in car. Put "unknowing" passengers in car. Terrify passengers. We've seen this before, haven't we? 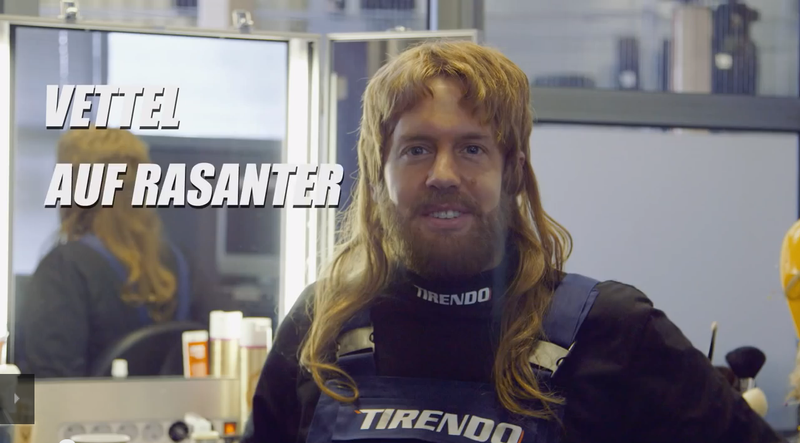 Bless their hearts, German Haus of Tireschnitzel Tirendo copied the format from Jeff Gordon's Pepsi Max ads using Formula One superstar Sebastian Vettel as a mechanic. They've even included a transformation montage at the beginning where the driver gets all dolled up. Look at where we're hiding cameras! That's exactly how the "Test Drive" and "Test Drive 2" transition into hoonage, too. The extent of my knowledge of the German language is limited to random Porsche parts, words for food and things I can't repeat to my mother, but the presence of shiny new Infinitis throughout the video suggests that this version is as fake as its American counterpart. You see, Vettel just left Infiniti Red Bull Racing, and that team loved putting him in shiny new test vehicles to do delicious smoky doughnuts, particularly when there's a valid promotional reason to do so. Sure, it's a tire vendor, but would there really be that many squeaky clean current-model Infinitis in for problems bad enough for a test drive to be necessary already? And where are the real German crapcans, like rusted-out E30s and well-loved Volkswagen Group subcompacts? On thing about it, though: perhaps the "Germans have no sense of humor" stereotype has an upside. They do appear to panic less than our own Travis Okulski. Of course it's fake, but we'll give it some credit for being fun. As far as originality goes, however—I award you no points, and my God have mercy on your soul.